wireless internet access available in guest and meeting rooms. including fine dining at Strip by Strega..
and golf within 5 miles. Groups benefit from extremely fast Wi-Fi, the latest in audiovisuals, and attentive staff who orchestrate even the most complex and high-powered affairs to perfection. The hotel’s beautifully renovated, 13,215-square-foot ballroom and 30 individual conference rooms adapt for a wide variety of events. The 55,000 square feet dedicated to meeting rooms easily accommodates groups of 10 to 2,200. The hotel’s unrivaled location affords meeting attendees a plethora of options. Boston’s historic Back Bay and other extraordinary sights await just a short stroll away. Onsite, guests enjoy in-room smart TVs with streaming capability and PressReader, which offers access to thousands of newspapers and magazines. They also receive access to the 20,000-square-foot Lynx Fitness Club and Topgolf Swing Suite. Dining options include Strip by Strega, featuring fine dining by legendary restaurateur Nick Varano; Off the Common, a lobby restaurant serving all-American fare; and, for coffee connoisseurs, Starbucks. This hotel is beautiful and takes you back in time with its historic elegance. The meeting space is awesome and so unique. The ballroom is so neat with the balcony seating it makes you feel like you are at a ball. Everything went great there for our meeting. This was our eleventh year and the most successful conference ever, due in no small part to the hotel's service, staff, and colleagues. The Boston Park Plaza Hotel & Towers employees are true professionals and were integral in making our meeting a huge success. This property has been certified Elite Gold	and meets at least 15 of Elite Meetings Criteria. Boston Park Plaza is pleased to announce the completion of a comprehensive, multi-year, $100 million renovation and restoration project. The extensive transformation includes the complete overhaul of the hotel’s 1,060 guestrooms and corridors, main entrances and lobby, meeting spaces, mezzanine levels, the addition of an all-new library room, and the replacement of all furniture and fixtures. The renovation project became official on May 7, 2016. New high-end amenities include STRIP by Strega, a 5,700-square–foot, high-energy steakhouse concept by Boston-based restaurateur Nick Varano; DavidBartonGym and Cyc Fitness Boston - a 20,000-square-foot state-of-the-art fitness center that includes complimentary gym access for hotel guests, plus an array of paid fitness classes; and an on-site FedEx Business Center offering guests the convenience of premium printing, packing and shipping from the hotel’s Mezzanine Level. Additionally, in late 2016, Starbucks will open a signature 2,500 square-foot store, and Leica Camera will occupy over 3,000 square feet with a Leica Store and a Leica Gallery, both within the hotel lobby. Through the renovation, Boston Park Plaza has also gained an additional 6,000 square feet of fully-renovated professional meeting and pre-function space, bringing its grand total to 50,480 square feet. Boston Park Plaza’s storied ballroom has also been fully updated to feature a stunning new charcoal and ivory palette. Designed by Sudbury, Mass.-based Parker Torres Design, Inc., Boston Park Plaza now evokes a youthful, innovative and international vibe that complements the hotel’s iconic architectural elements. The new lobby of the Boston Park Plaza boasts a sophisticated gray and white color palette, dramatic floor-to-ceiling columns encased in ceramic, new flooring, adjustable LED lighting, and sleek guest check-in stations designed to create a more intimate experience between hotel staff and guests. Located within the renovated lobby area is Off The Common, Boston Park Plaza’s new restaurant and lounge, which offers a sophisticated and contemporary setting to enjoy breakfast, lunch, dinner, light bites and hand-crafted libations. Designed to satisfy the needs of many, Boston Park Plaza’s newly added library room can act as the ideal shared workspace and reading area, or simply serve as an inviting place to visit with friends. As guests enter the hotel’s revitalized guestrooms and suites, which boast all-new lighting and much-improved acoustics, they’ll be welcomed by a handsome, tailored and chic palate of charcoal, caramel and camel tones that complement all-new stone-topped wooden cabinetry, custom upholstered headboards, and warmly-hued carpeting. Adding a crisp, fresh touch to the highly-appointed guestrooms are completely renovated bathrooms featuring white tile surrounds, custom vanities, over-sized mirrors and large porcelain tile flooring. As a nod to Boston Park Plaza’s iconic design details, each room’s crown molding has been fully refinished in order to preserve signature elements that pair with the hotel’s new smart and sophisticated appearance. Additional technology enhancements to each guestroom include the addition of Smart TVs with streaming capabilities via SoniCast (powered by Chromecast), which allows guests to sync their mobile devices to the TV and customize their video content. Since purchasing the property, Sunstone Hotel Investors, Inc. has performed a series of renovations to repair and restore all structural elements, which includes replacing the hotel’s roof; repairing the exterior façade; replacing sidewalk surrounds; replacing the hotel’s signature two-story decorative windows; modernization of the elevator systems; and the installation of a state-of-the-art HVAC system that provides individual climate control for every guestroom, meeting space and common area. Boston Park Plaza is managed by Highgate, a premier hospitality investment and management company whose growing portfolio includes more than 100 properties in gateway cities worldwide. First opening its doors to the general public as the Statler Hotel in 1927, for nearly 90 years the Boston Park Plaza has served as one of the nation’s iconic hotels, playing host to dignitaries from Winston Churchill and President Franklin D. Roosevelt to Hollywood royalty including Katherine Hepburn and Judy Garland. Today, Boston Park Plaza has completed a $100 million renovation of its guest rooms and public spaces. The hotel serves as an epicenter for stylish Bostonians and discerning travelers alike, by offering exceptional concierge and guest services, 1,060 finely-appointed guestrooms, sophisticated dining options from STRIP by Strega, Boston’s only high-energy, uber-modern luxury steakhouse, and Off The Common, the hotel’s all-new restaurant and lounge offering chic, yet casual American fare and craft cocktails. Additional amenities include a 20,000 sq.-ft. David Barton Gym fitness center, FedEx Office Print & Ship Center, and over 50,000 sq.-ft. of exceptional meeting space. Boston Park Plaza is a member of Preferred Hotels & Resorts and Historic Hotels of America. For more information or to make a reservation, visit www.bostonparkplaza.com or call 1-800-225-2008. Follow Boston Park Plaza on Twitter, Instagram, and Facebook at @BostonParkPlaza. Highgate is a premier hospitality investment and management company widely recognized as an innovator in the industry. Highgate is the dominant player in U.S. gateway markets including New York, Boston, Miami, San Francisco and Honolulu. Highgate also has an expanding presence in key European markets through properties in London, Paris, Barcelona, Vienna and Prague. Highgate’s portfolio of global properties represents an aggregate asset value exceeding $10B and generates over $2B in cumulative revenues. The company provides expert guidance through all stages of the hospitality property cycle, from planning and development through recapitalization or disposition. Highgate also has the creativity and bandwidth to develop bespoke hotel brands and utilizes industry leading proprietary revenue management tools that identify and predict evolving market dynamics to drive outperformance and maximize asset value. With an executive team consisting of some of the industry’s most experienced hotel management leaders, the company is a trusted partner for top ownership groups and major hotel brands. Highgate maintains corporate offices in London, New York, Dallas, and Seattle. Experience all-new common, meeting and event spaces, plus sophisticated lifestyle amenities! 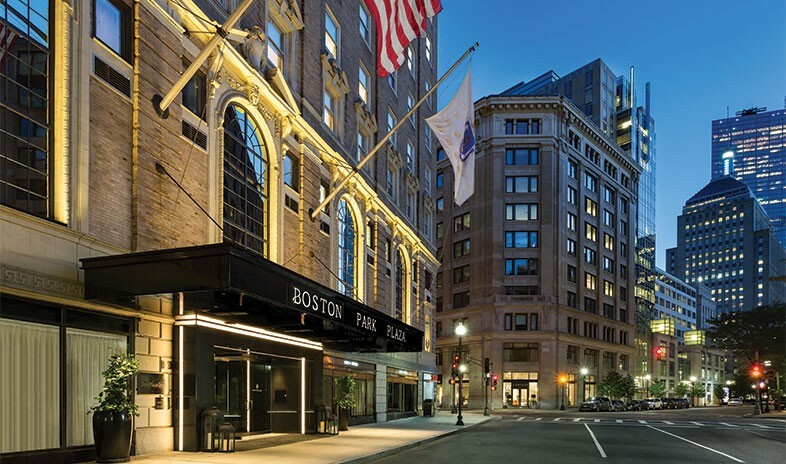 Boston Park Plaza is pleased to unveil the completion of renovation phases one and two of the new Boston Park Plaza located at 50 Park Plaza in Boston. First opening its doors to the general public as the Statler Hotel on March 10, 1927, Boston Park Plaza has served as one of Boston’s and the nation’s iconic hotels for nearly 90 years, playing host to dignitaries like Winston Churchill and President Franklin D. Roosevelt, as well as celebrities such as Katherine Hepburn and Judy Garland. Situated on the grounds from which British troops embarked for the battle of Lexington, the Boston Park Plaza is in the midst of a $100 million dollar total hotel renovation and restoration project that will solidify the property’s arrival as a convenient, modern and amenity-laden hotel that serves as a destination for tourists, travelers and Bostonians, alike. Since purchasing the property in 2013, Sunstone Hotel Investors, Inc. has performed a series of renovations to repair and restore all structural elements, which includes replacing the hotel’s roof; repairing the exterior façade; replacing sidewalk surrounds; creating 5,500 square feet of prime retail space; replacing the hotel’s signature two-story decorative windows (scheduled for summer 2015) and the installation of a state-of-the-art HVAC system that provides individual climate control for every guestroom, meeting space and common area. Beginning late December 2014, the Boston Park Plaza underwent the second of three renewal phases, leading to the complete overhaul of the hotel’s main entrances, lobby, meeting spaces and mezzanine levels designed by Sudbury, MA-based Park Torres Design, Inc. Now, the main lobby area of the property evokes a youthful, innovative and international vibe that complements the hotel’s iconic architectural elements. No longer serving as a simple pass-through for guests, the space functions as a complete multidimensional experience by offering a diverse and customizable selection of seating areas that include options for intimate dining, sipping cocktails in a cozy corner, or closing a business deal. The new lobby of the Boston Park Plaza boasts a sophisticated gray and white color palette, dramatic floor to ceiling columns encased in ceramic, new flooring, adjustable LED lighting and sleek guest check-in stations designed to create a more intimate experience between hotel staff and guests. Located within the renovated lobby area is Off The Common, the Boston Park Plaza’s new restaurant and lounge, offering guests and those passing by a casual, sophisticated and contemporary setting to enjoy lunch, dinner, light bites and hand-crafted libations. By relocating on-site office space from the mezzanine level to the third floor, the new Boston Plaza has gained an additional 6,000 square feet of fully-renovated professional meeting and pre-function space. Boston Park Plaza’s storied ballroom has been fully updated to feature a stunning, new charcoal and ivory palette and fully restored, historic crystal chandeliers. Amplifying the hotel as a true destination are the additions of STRIP by Strega, an all-new 5,700 square foot high-energy steakhouse concept by Boston-based restaurateur Nick Varano, which fuses together the look and feel of a sophisticated, uber-modern steakhouse with that of a sleek, high-end lounge, and a 19,000 square foot state-of-the-art fitness center by DavidBartonGym that includes free access for guests. Scheduled to begin November 1, 2015 and slated for completion by June 2016, phase three of Boston Park Plaza’s multifaceted renovation will see the total renovation of all guest rooms, suites, bathrooms and corridors, and will include the replacement of all furniture, fixtures and equipment. This final phase of the repositioning will be completed without any disruption to hotel guests. First opening its doors to the general public as the Statler Hotel on March 10, 1927, for nearly 90 years, Boston Park Plaza has served as one of Boston’s and the nation’s iconic hotels, playing host to dignitaries like Winston Churchill and President Franklin D. Roosevelt, as well as celebrities such as Katherine Hepburn and Judy Garland. Today, Boston Park Plaza serves as an epicenter for stylish Bostonians and travelers, alike, by offering exceptional concierge and guest services, 1,054 finely-appointed guestrooms, sophisticated dining options such as STRIP by Strega, Boston’s only high-energy, uber-modern luxury steakhouse, and Off The Common, the hotel’s all-new restaurant and lounge offering a chic, yet casual setting for breakfast, lunch, dinner and hand-crafted libations. Additional guest services include a DavidBartonGym fitness center, FedEx Office Print & Ship Center, and 50,480 square-feet of exceptional meeting space. For more information or to make a reservation, visit www.bostonparkplaza.com or call 1-800-225-2008 to speak to a representative. Boston, Massachusetts, 5 May 2008 to Present—The Boston Park Plaza Hotel & Towers, a member of Historic Hotels of America, recently announced its goal to become an environmentally sensitive hotel at every level. Through its green practices, the hotel wishes to reduce their overall carbon footprint, while maintaining its immaculate luxury and elite service. The hotel’s primary concern is decreasing energy use and conserving a greater amount of resources in its day-to-day operations. The hotel utilizes a bi-fuel converter, allowing the most efficient natural resource to be purchased for hotel energy. Compact florescent bulbs, which use less power and last longer than regular light bulbs, are used in the office space and in all guestrooms. Lighting motion detectors have been installed in the office and meeting spaces and the hotel employs a state-of-the-art energy management system which detects when a guestroom or public meeting room is vacant and turns off all heating and air conditioning. The system also detects when an occupied room is temporarily vacant and sets the guestroom to room temperature. A “green roof” was installed on the building to decrease heating and cooling costs and to help maximize energy efficiency. In addition to energy conservation, the hotel is also focusing its efforts on decreasing water and paper use. The front desk uses a paperless check-in/check-out policy and the hotel makes every effort to purchase only recycled or recyclable products. Recycling containers have been added to hotel office space and operational departments for paper, aluminum and plastic disposal. In regards to water conservation, the laundry department utilizes a water reuse system in which water is cleaned and used three times before being disposed. The food and beverage department also employs green practices, composting biodegradable organic food waste and recycling all kitchen oils. The hotel uses bulk dispensers and reusable containers for beverages, food & condiments and uses reusable serving utensils, napkins and tablecloths when food and beverage is served. Training is the primary focus in the hotel’s green practice initiative. Park Plaza employees are trained on ways that they can help with conservation and are encouraged to become involved with the hotel’s green initiatives. All employees have gone through Save That Stuff Recycling Training and the hotel’s Green Team, which consists of employees from different departments, meets weekly to discuss conservation ideas and issues. The hotel has not only increased its green efforts at the operational level, but has also offered guests the chance to do their part in conserving resources. Guests have the option to reuse towels and bed linen instead of having them changed daily through the hotel’s green program. Guests also have the opportunity to take advantage of the hotel’s location while minimizing green house gases—the hotel is located one block from both subway and bus transportation and is within walking distance to many restaurants, shops and attractions, eliminating the need to drive. The Park Plaza’s marketing team is targeting green practices by redesigning all printed collateral pieces and making them available online. Special environmentally friendly packages have also been implemented, including the Bike Boston Package - an eco-friendly biking tour around Boston, and the Hybrid Package, which rewards guests who drive Hybrid cars with complimentary overnight valet parking. Built in 1927, The Boston Park Plaza Hotel & Towers is a member of Historic Hotels of America and a recipient of Successful Meetings Pinnacle Award for delivering excellence in meetings. Some of the city’s top restaurants can be found at The Boston Park Plaza Hotel & Towers including Pairings – food & drink with personality, Statler Lounge, Afternoon Tea, Finale Desserterie, McCormick & Schmick’s Seafood Restaurant, The Melting Pot, and M.J. O’Connor’s Irish Pub. With an unmatched location for business and leisure travel, this historic hotel is easily accessible to public transportation, shopping along Newbury Street, the Public Garden, Boston Common and most historic landmarks. Rich in history, The Boston Park Plaza Hotel & Towers has distinguished itself with classic elegance and personalized service that continues to attract travelers from all over the world who visit Boston for business, leisure or special events. Boston, Massachusetts, 5 May 2008"The Boston Park Plaza Hotel & Towers, a member of Historic Hotels of America, recently announced its goal to become an environmentally sensitive hotel at every level. Through its green practices, the hotel wishes to reduce their overall carbon footprint on the planet, while maintaining its immaculate luxury and elite service. The hotels primary concern is decreasing energy use and conserving a greater amount of resources in its day-to-day operations. Considering increased costs and growing environmental concerns, it is becoming increasingly more important for us to focus our efforts on conservation, said Hotel Manager Greg White. We have made significant improvements to our boiler system, and we want to continue to reduce the amount of water, electricity, gas, and oil that we use. The hotel utilizes a bi-fuel converter, which allows the hotel to purchase the most efficient natural resource to provide energy to the building. Compact florescent bulbs are used in all 941 guest rooms and suites, and motion detectors have been installed in office and meeting space to conserve energy. The hotel employs a state of the art energy management system that detects when a room is vacant, which automatically turns off the heating and/or air conditioning. The system also detects when an occupied room is vacant and automatically sets the system back to room temperature. In addition to energy conservation, the hotel is also focusing efforts on decreasing water and paper use. The front desk uses a paperless check-in/check-out policy and the hotel makes an effort to purchase only recycled or recyclable products. Recycling containers have been added to hotel office space and operational departments for paper and plastic disposal. In regards to water conservation, the laundry department has a water reuse system in which the water is used three times before being disposed. The food and beverage department also employs green practices, using bulk dispensers, reusable containers and reusable serving utensils, napkins and tablecloths. The department also composts biodegradable organic food waste. Training is a primary focus in the hotels green practice initiative. Park Plaza employees are trained on ways that they can help with conservation and are encouraged to become involved with the hotels green initiatives. The hotels Green Team, which consists of employees from different departments, meets weekly to discuss conservation ideas and issues. Upcoming projects include installing a green roof to decrease energy heating and cooling costs. The hotel has not only increased their green efforts at the operational level, but has also offered guests the chance to do their part in conserving resources. Guests have the option to reuse towels and bed linen instead of having them changed daily through the hotels Green Linen program. Park Plazas Green Newspaper Delivery Program allows guests the option to have a daily newspaper delivered to their room. Guests have the opportunity to minimize green house gases"the hotel is located one block from both the subway and bus transportation and is within walking distance to many restaurants, shops and attractions, eliminating the need to drive. The Park Plazas marketing is also targeting green practices, by offering environmentally friendly packages. The Go Green Package features an eco-friendly bike tour around Boston, while the Hybrid Package, rewards guests who drive Hybrid cars with complimentary overnight valet parking. It is everyones responsibility to conserve natural resources, said White. We want to have a positive impact on the global environment. The Boston Park Plaza Hotel & Towers is completing a $5 million room renovation that updates the technology and comfort of guestrooms while preserving the hotels historic integrity. Built in 1927, The Boston Park Plaza Hotel & Towers is a member of Historic Hotel of America, and a recipient of Successful Meetings Pinnacle Award for delivering excellence in meetings. Some of the citys top restaurants can be found at The Boston Park Plaza Hotel & Towers including Todd Englishs Bonfire Steakhouse, Swans Caf, Whiskey Park, McCormick & Schmicks Seafood Restaurant and M.J. OConnors Irish Pub-- a restaurant to suit virtually every taste. With an unmatched location for business and leisure travel, this historic hotel is adjacent to the Public Garden with its Swan Boats and Boston Common. Boutiques, art galleries, restaurants and cafes along famous Newbury Street, are just one block away. Rich in history, the hotel offers the same hospitality and service that has attracted United States Presidents, international business leaders and celebrities for the past 81 years. This feature is for members only. Please sign in or join to perform this action.